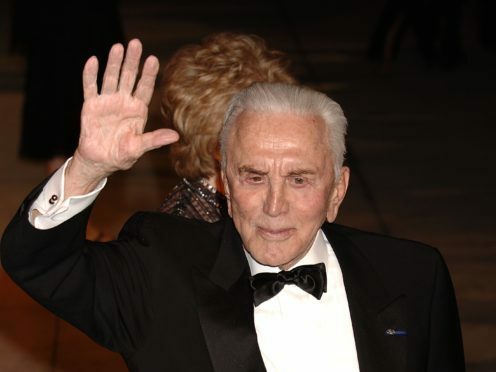 The grandson of Kirk Douglas has shared a touching moment of the veteran actor with his great-granddaughter. The 101-year-old was pictured smiling down at eight-month-old Lua Izzy, whose father is Cameron Douglas, while she reached out for his hand in the black-and-white snap. Kirk’s Hollywood career has spanned seven decades and includes three Oscar nominations, as well as an honorary Academy Award in 1996. He is best known for roles in Spartacus in 1960 and 20,000 Leagues Under The Sea in 1954. He has also starred in a number of Westerns, including Along The Great Divide and Lonely Are The Brave, as well as early Stanley Kubrick film Paths Of Glory in 1957. Douglas has been married to Anne Buydens, his second wife, for 64 years and has seven grandchildren – Cameron, from Michael’s marriage to Diandra Luker, Carys Zeta Douglas and Dylan Michael Douglas from Michael’s marriage to Catherine Zeta Jones, and Tyler, Kelsey, Ryan and Jason Douglas by his son Peter.